Introducing the MB882HX-1SB 2.5” SATA SSD Xpander Hybrid Adapter. Using a high speed 2.5” SATA SSD and a high capacity 3.5” SATA hard drive, you can combine them to create a new breed of species. Using our hybrid technology, we can take a moderate or 2nd generation 2.5” SATA SSD in combination with a mid to higher end 3.5” SATA hard drive which automatically creates “hybrid partition” and “storage partition”. 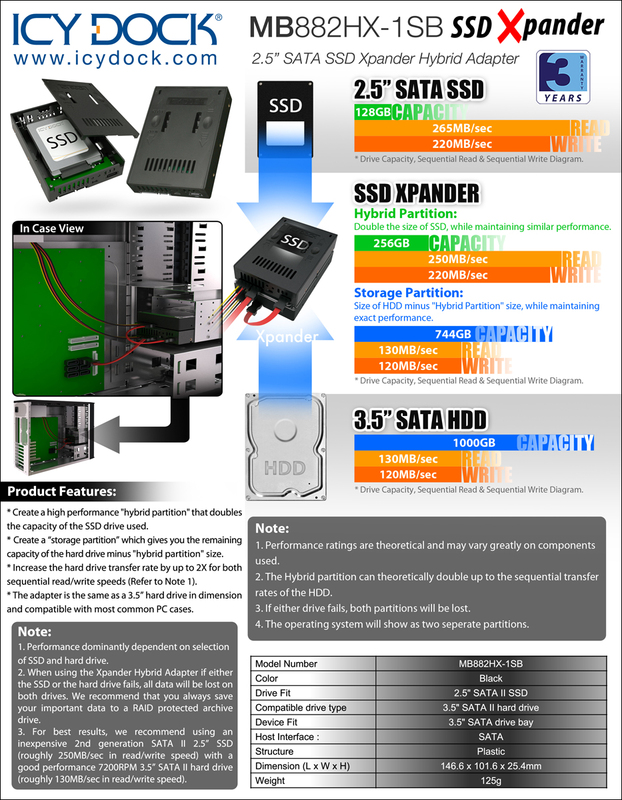 The “hybrid partition” doubles the capacity of the SSD drive and provides high performance in transfer rates. The storage partition gives you the remaining capacity of the hard drive* (the size of the 3.5” SATA hard drive minus “hybrid partition” size). This is the perfect upgrade solution without purchasing an expensive high capacity SSD. The Xpander Hybrid Adapter doubles the sequential transfer rates of the hard drive exclusively in the hybrid partition, it is great for people who move, play or edit large media files. Such as a video editor, graphic designer, HD movie enthusiast that use applications like Adobe Photoshop, Sony Vegas and Windows Media Center that require large file loads / transfers. For editing, you can use the hybrid portion as a sketch drive; move the working files to it for fast editing. When you are done with the file we recommend moving the file to a RAID protected archive drive. The “storage partition” is perfect for non-important applications or files i.e. games, movies, music, or other media files.